Mucha regularly holidayed in the coastal province of Brittany in northwestern France, and referred to this panel as La Bretonne. The plant carried by the Breton woman is in fact not a thistle but a sea holly which flourished in coastal areas (www.muchafoundation.org). I love Mucha's work. I bought a 2014 diary with Mucha illustrations, but it has been too nice to use . . . .
Lovey picture of a sweet-faced Breton lady. The colours of the shawl echoed in the background too. I like the use of her profile against the stylized background. 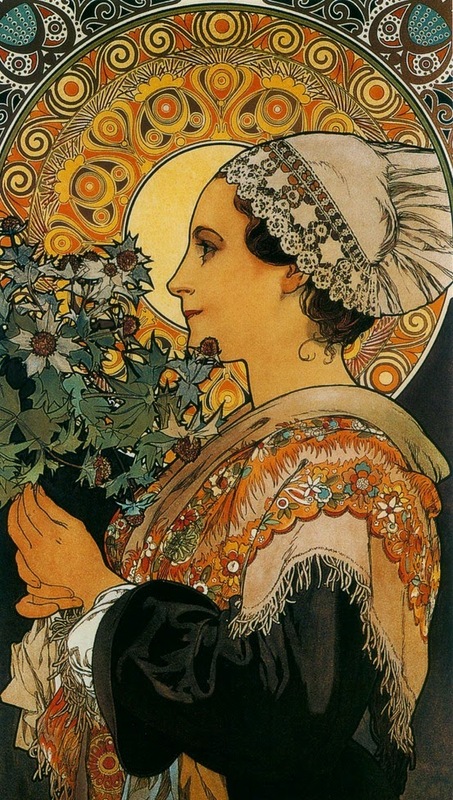 I just associated Mucha with Czech culture -- didn't know he spent time in Brittany.